In anticipation of the newest cruise ship joining its fleet, Regent Seven Seas Cruises announced in January details of the Regent Suite on Seven Seas Splendor, the largest and most elegant suite ever built on a luxury ship. The lavish Regent Suite sets the tone for all 14 other suite categories on Seven Seas Splendor. 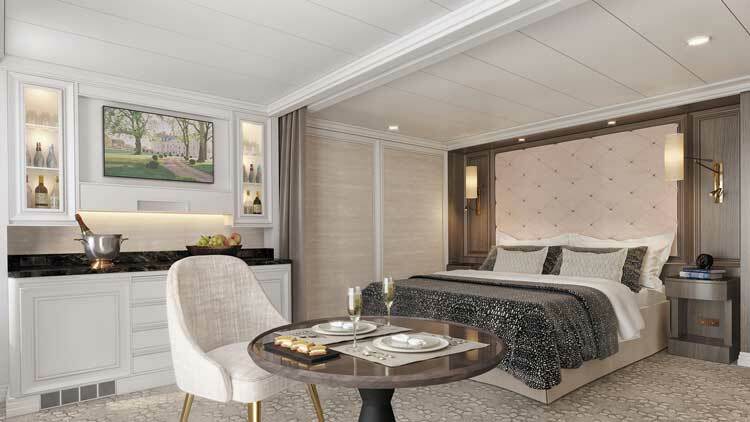 Today, Regent reveals additional details of all guest suite categories, further establishing Seven Seas Splendor as the ship that will perfect luxury when she debuts in February 2020. Luxury is found in intricate details, exquisite finishings and enormous balcony space. More than 46,000 square-feet of Italian marble will adorn Seven Seas Splendor -- more than an acre of marble -- including the marbledetailed bathrooms in each of her 375 guest suites. Nearly 52,000 square-feet of balcony space is found on the allbalcony vessel -- larger than the size of an American football field and averaging 138 square feet of balcony space per suite. Approximately 500 crystal chandeliers will illuminate the ship’s interior. The Master, Grand, Splendor and Seven Seas suite categories represent the 32 Distinctive Suites on board Seven Seas Splendor. Guests in Distinctive Suites enjoy personalized butler service, guaranteed dining reservations and customized pillows and bath products, among other amenities. These suites are designed to blend comfort and luxury, focusing on impeccable details, exquisite high-contrast materials and lush jeweltoned accents. The suites are designed by Studio Dado, Tillberg Design, and Total Solution Interiors. Concierge Suites. Concierge Suites are highlighted by a soothing color palette of creams and blushes that inspire serenity and comfort. This 464 square-foot suite aboard Seven Seas Splendor comes in two categories and is purposefully designed to maximize ocean views, with the custom-crafted Elite SlumberTM Beds facing the private balcony, allowing guests front row access to stunning ocean scenery. Skilled master craftsmen adorn headboards with the finest shagreen leather, and furniture is upholstered with the most elegant Italian fabrics. Guests who stay in a Concierge Suite or a higher category suite enjoy a free one-night precruise hotel package. Regent Seven Seas Cruises offers an unrivaled experience to luxury travelers. The cruise line’s modern fourship fleet visits more than 450 iconic and immersive destinations around the world, and will add Seven Seas Splendor in 2020 as the fleet’s fifth ship and then grow by a sixth ship in 2023. All luxuries are included in Regent Seven Seas Cruises voyages, such as all-suite accommodations, round-trip business-class air on intercontinental flights from the U.S. and Canada, the largest collection of unlimited shore excursions, unlimited internet access, highly personalized service, exquisite cuisine, fine wines and spirits, gratuities, ground transfers and one-night, pre-cruise hotel packages for guests staying in Concierge-level suites and higher. In 2018 the cruise line concluded a $125 million refurbishment program of Seven Seas Mariner, Seven Seas Voyager and Seven Seas Navigator to elevate the fleet’s elegance to the benchmark set by Seven Seas Explorer.